Do you still remember the Benefit To Go Beauty Bestseller Set I got last year for $10.00 (approx Php420.00)? I tested the Benefit Posietint and forgot about the rest. *ashamed* Thanks to the constant queries from AMW readers on how to achieve dewy and glowing skin! 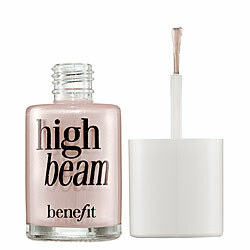 Benefit High Beam is an ethereal pink liquid highlighter that creates a radiantly dewy complexion. For an angelic sheen, this pink shimmering lotion adds a soft, natural afterglow. Ingredients: Water, Propylane Glycol, Sesame (Sesamum Indicum) Oil, Mica, Isopropyl Palmitate, Isopropyl Lanolate, Stearic Acid, Safflower (Carthamus Tinctorius) Oil, Glyceryl Stearate, Titanium Dioxide, Polysorbate 60, Cetyl Alcohol, Jojoba (Buxus Chinensis) Oil, Magnesium Aluminum Silicate, Corn (Zea Mays) Starch, Triethanolamine, Talc, Oleth-20, Iron Oxides, Lanolin Wax, Simethicone, Sorbitan Stearate, Cellulose Gum, Methylparaben Diazolidinyl Urea, Propylparaben, BHA. Good for 6 months upon open. Very cute packaging. Both the original size and sample size. Very natural and subtle, won't create a disco-ball effect. A little goes a long way. With the right application, your whole face looks lifted and bright! Even with direct flash, does not show white cast. Does not oil up or turn greasy. Perfect for any skin type! Works on most skin tone! Even if you pat setting powder on top of the Benefit's High Beam, there's still an unexplainable "glow" underneath especially under sunlight! Lasts a while, the mini sample version lasted me more than 3 months and I'm still using it now (on a twice a week basis). Highlighting powders are the easiest to manage but if you want them to stay for the whole day, I strongly recommend Benefit's High Beam! It's not too white as it has a hint of sheer pink shade which makes it look so natural even applied beneath the foundation! The trick is to blend it well before it dries up completely. 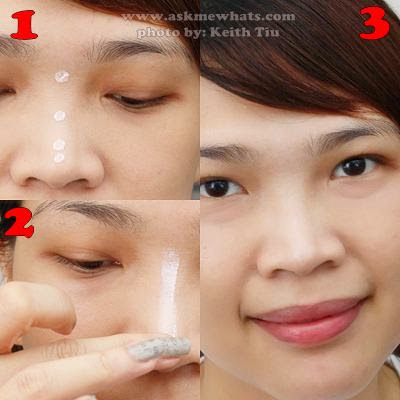 Use this on areas wherein you would want the light to reflect specific areas of your face. (cheekbones, the bridge of the nose brow bone and inner corner of the eyes). 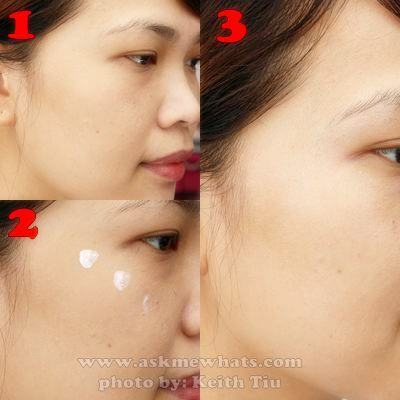 Want a soft, dewy look all over your face? Mix a bit of this product to your favorite liquid/cream foundation. Start with dots then blend it gently and quickly. Do not apply too much at once as a little goes a long way. If you want a dewy foundation look, try not to set this powder, if setting is needed, try to steer clear from areas you used High Beam on. Anyone with any skin tone who are addicted to highlighting! Anyone with young to mature skin! I got my sample sizes at Maison d'elan House of Flair online store . I love this product for the fact that its fool proof! Even if you put a bit too much, you can easily blend it to make it look natural or you can always "correct" by patting with your choice of powder. I'll keep this on my "to buy" list when I travel to Hong Kong or if anyone can refer to me and AMW readers a legit, price-worthy, local resellers who carries Benefit High Beam! it looks good on you.... there's really a nice glow when you used it! Nikki, get a bunch of girls together and order straight off the Benefit site - free international shipping if you spend over US$125 (sometimes they offer international shipping at less). It's cheaper than any Benefit prices in Asia and they give free gifts and samples once you register! How would it compare with Guerlain's Meteorites? @Kumiko Mae LOL! the pricey will still be there for sure! hahahah pero ang gaganda nga!!! I'm loving their High Beam and Posietent! Wonder how Benetint fairs! Have you tried it? @Marge Go na! compare it! i've seen a lot of Korean branded cosmetics selling similar highlighters, on my part, I want to try them too! @K Yes so far it does because I don't have oily skin ha? It could be a different story if you have oily skin! But nothing a primer can't save! @TPS Dear! Sorry I do not have the Guerlain Meteorites, super pricey kasi at di nag sasale!!!! Will swatch when I get the chance! I love the nice glow it gives your skin! I can't wait for the Benefit to come here in the Philippines. So pretty!! Totally agree with Myrted - Your inner beauty really shines through!! Very pretty - looks like YSL Touche Eclat! it looks good ha? natural lang. i was worried it would look unnatural for warm skin tones because it's pinkish. @gio I agree :) That's why I love this product! Aaww, super sweet yung comment mo, I do appreciate that when people appreciates my personality! Beauty on the outside may fade but personality never will! :) Mwa! @xin I don't want to start! LOL!!!! @Jamilla Camel Ooh the famous YSL touche Eclat which I never tried! if its almost the same, I'm happy! @Anne Yes, that's what I heard too!!! Excited! Hi, parang bb cream dn ba to? What i mean is, natatakpan ba nito ung scarce etc.? thanks!